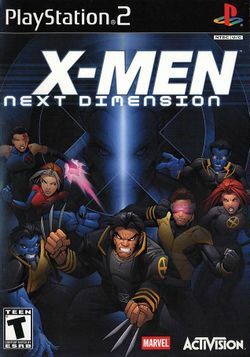 X-Men: Next Dimension is a fighting game, released in 2002 for the Xbox, PlayStation 2, and GameCube video game consoles. It is the third game in the X-Men: Mutant Academy fighting game series, following X-Men: Mutant Academy and X-Men: Mutant Academy 2. Narrated by Patrick Stewart (reprising his role as Professor Charles Xavier from the X-Men trilogy of films), the game's plot is built around the Prime Sentinel, and his attempt to retrieve the head of Bastion. The game opens with Forge and other members of the X-Men training in the Danger Room (the graves of Anthony Stark, Warren Worthington III, Peter Parker, and Benjamin Grimm can be seen in the Danger Room in the opening cinematic). It's during this training session that the Juggernaut, joined by a few members of the Brotherhood of Mutants, such as Mystique, Toad, and Sabretooth, make their assault on the mansion. Xavier is curious as to the nature of their attack, and sends Forge to investigate the grounds. He discovers that the attack was a distraction, and that the grounds are now being patrolled by Sentinels. Forge is subsequently abducted, and the Brotherhood retreats. Restrained in the company of Bastion, the seemingly-human Sentinel tells Forge he intends to use the Native American's mutant gift to bring about the extinction of mutants. He sends the Brotherhood to different locations across the world. The X-Men split up and engage each member in a bid to find Forge and stop the Prime Sentinel. This page was last edited on 8 September 2009, at 22:25.